On Tuesday 21 August 2012, the Australian Society of Archivists hosted the Loris Williams Annual Lecture at State Library of Queensland. Guest speaker Dr Jackie Huggins, a close associate of the late Loris Williams and her family for decades, delivered that year’s lecture. The theme was ‘Reclaiming Identity, Place and Story: Aboriginal and Torres Strait Records’. I wish to acknowledge and pay my respects to the traditional owners of this land where State Library resides – the Jagera and Turrbal peoples and to the Elders, past, present and future. Thank you to the organisers for inviting me to present the Loris Williams lecture tonight particularly Kathy Frankland and Margaret Reed from Community and Personal Histories. Thank you Kathy for being a friend to many of us, a great mentor to Loris and for providing me with photos and material for my presentation tonight along with my other colleagues Janet Prowse, Sue Hutley and Niles Elvery from Queensland State Archives where I have worked recently. To Lea Giles Peters for always believing in everything Indigenous in her time as State Librarian and her unwavering support of Loris. To Loris’ family thank you for your assistance too and for coming especially Eileen who like her usual feisty self is here with us tonight. Loris Williams was born in Brisbane on 16th September 1949 to Cyril and Agnes Williams. The Williams Bunch (just like the Brady’s) had 3 girls and 3 boys – Eileen, Loris, Bryan, Ted, Neil and Robyn. They remain a well respected community family and I have been privileged to know them over 40 years with a deep connection being between our two Mothers Agnes and Rita who were both removed to Cherbourg Aboriginal Mission just three hours north from Brisbane in the 1920s. Like all Cherbourg families they kept up a lifetime friendship. These two women shared a similar story and history complements of the 1897 Aboriginal Protection and Restriction of Sale of Opium Act. Key aspects included, among many things being incarcerated on the reserve as children, being sent to domestic servant work, again as children themselves, being subjected to the brutal laws of the time, denied to speak language, practice customs, receiving their exemption certificates, meeting their husbands and growing up a family in Brisbane. Aunty Ag as we called her came from the large Bell family and graciously consented to many interviews with me over the years when I was going through one of my most creative streaks in writing history in the early 90’s. So my primary source material was always on tap. And WHAT stories they were. One particular story that Aunty told me about the pink scar she carried on her face, will resonate in my mind forever. This was during her domestic servant days where she was subjected to a cruel Mistress on a cattle property where she worked. And I often thought this is the THANKS these beautiful women received. “My how times have changed” as I have a white woman who cleans my house now! My Mother’s and Aunty Ag’s almost identical treatment and lives was per “unkind” favour of the Act and its subsequent amending 1939 Aboriginals Preservation and Protection Act. And how I came to despise this legislation, as every bit of our family’s lives on the reserve were controlled and under surveillance. Every action and association was monitored. Employment, including wages was managed by the reserves Superintendants. Later this was infamously known as the Stolen Wages. And please don’t get me started with what happened to that money! In the end it is ironical that the Government’s insistence to document and keep these detailed records would serve as treasures of history in years to come. Therefore the “Preservation” in the Act was unwittingly exactly that – to preserve history. The Acts did not preserve our people. In fact they humiliated them. Thankfully the written evidence of their lives remained intact somehow and would decades later illuminate some of the hidden stories and history of our communities and families. Be grateful for small mercies I keep reminding myself. My time with Loris goes back when she worked at the then PMG and I was delighted when she began her studies as an Archivist and becoming our first Queensland Murrie Archivist. I was elated – my role as a historian would be enriched and supplemented through having her there with the records at her fingertips. I frequently called her on occasions for help and being the true lady she was she willingly obliged – within the confines of what she could offer me of course. There are few people in this world you meet who have such unshakeable loyalty and devotion to their jobs and Loris was one of them. How she shone in that role. Like lawyers I think Archivists are born, not made. Loris knew the history of her Mother and this was my Mother’s history too. We didn’t need to transcend any barriers. We shared the same pain. Her story was mine also. It is true “We really are the stories we tell about ourselves” – the bad and the good. In retrospect I should have called my talk “My how times have changed” because I would like to tell you my story when I conducted research for my book “Auntie Rita”. One of the many contemporary forms that the silencing takes is the resistance that Aboriginal people meet in white bureaucrats when they attempt to see Aboriginal records. Files were compiled on every person who had live on a reserve, in Queensland and elsewhere and often were continued long after the person had moved on. As part of writing this book, we sought access to my mother’s personal files held by the Department of Family Services and Aboriginal and Islander Affairs in 1990. When I first made enquiries about seeing my mother’s file, I was made to watch across a huge desk as two white public servants turned the pages. They stopped at various pages and read them, and made comments to each other that I couldn’t hear. These gatekeepers behaved as if the files were their personal property whereas they are in fact part of my people’s inheritance, part of a history that remains to be recovered and claimed. A white friend of ours had far greater access to these files than we would ever have. He was taken to be a credentialed researcher whereas I am dismissed as just another Blackfella wanting to know some family roots. The Tindale genealogies and photographs were also an invaluable source for our research. As Swain and Musgrove comment, “Files were compiled for bureaucratic reasons and preserve the forms and documents necessary to ensure the efficient operation of an organisation without making any attempt to tell the story of a life.” (2) Rumours abound that governments of the day embark on removing contenscious material kept on files which could call them to account later. I could not help feeling that the second time we saw Mother’s files that the paper was cut and shredded. It did look like fresh scissor marks to me and even Mum thought it was a lesser file with pages removed. However the missing pieces in individual personal records are not always the result of information being withheld, or in this case my paranoia. Often the traces of people’s lives are scattered across many different files, meaning that the request for a particular file is just the beginning of a trail that will lead through many archives. For instance there are a myriad of the government, departments and legislation which could apply to many Indigenous people researching their family history. How we navigate this can be perplexing and therefore Archivists should ensure that the extent and nature of available records are clearly identified. So “my how times have changed”. No longer are records barricaded for researching family history. Access has improved outta sight all over the country for Indigenous peoples. We would like to think that my Mother’s and my experience in Queensland, detailed earlier, was not in vain and that this had something to do with it. As already mentioned there is a wealth of material now. Even the most seasoned researcher gets confused with the various avenues of where to go to get information. So here are some guidelines of who does what and what is where. Many indexes such as birth, deaths and marriages are available online in many states as are War Records. Incidentally last week I got copies of my Grandfather and Father’s WWI and II records from the National Archives. Needless to say I was thoroughly disappointed. They were sketchy, disjointed and illegible compared to the Personal Files. Only one letter of my Father’s remained requesting his medals for service. So at least I know now what his beautiful handwriting looked like. But as far as the history is concerned and in order to write his book I now have to rely on the living narrative Mother told us everyday about him to complement this written documentation. Here the oral history is much more powerful than the text – a common feature in Aboriginal writing and storytelling. So in what other ways can professionals help? Archivists, librarians and historians have to move beyond their traditional roles. Historians see archived documents as static artefacts but connection of records to personal identity is important. (4) And ”how times have changed” if we would be able to comment on the comments that files contain about our people, our families and communities. Archivists cannot change what is contained within the files of course, but they can think about their practice taking into account the perceptions and sensitivities of those accessing the files. In traumatic memory, Dominick Capra has argued, the past is not simply history as over and done with. It lives on experientially and haunts and possesses the self or the community. (5) It is part of the role of both historians and archivists to work alongside researchers as they navigate their way through records likely to revive or elicit such memories. Loris understood this very well and she would offer her wise counsel at every level. The supported and sensitive release of records cannot be underestimated when applicants and their descendants first read their files. Archives have an ongoing duty of care to deal with this dilemma. Archivists should be aware that older people and Elders may require more time and sensitivity when accessing their records due to the immediacy of the content, and the impact it may have on them. Therefore there is a requirement to work out what is sensitive material and what is not. Time permitting I will share another story with you later and I am sure many of us here have our own stories. Barbara Reed has commented that recordkeeping “does not occur in a cultural or political void” and question the extent to which we can create flexible practices that are responsive to broader, and potentially fluctuating, social needs. (6) Hence it cannot be denied the rapid pace of the Indigenous community accessing records since the 90s, through the Bringing Them Home Report in 1997, Link Up work, Aboriginal identification and more recently for Native Title. The workload this places on staff is enormous and all credit to them. Keep up the great work you do guys. And if any powers that be hear this they need more resources. And “my how times have changed” too in respect to the Aboriginality issue. More than ever Aboriginal and Torres Strait Islander peoples are identifying in the census. There has been a huge increase in numbers. Why this is so may have many answers. For me I would like to believe that there is a growing sense of pride in being Aboriginal moreso than when I was growing up in the 60s way and before that. The stigma has now become the new mantra. The archivist’s primary responsibility will always be to the preservation of the record. The time for gate-keeping is over yet I still hear stories of frustration around the country re accessing files from institutions and these aren’t only Indigenous records and from Indigenous people. In these days of rampant social media do be careful of the language and images posted on the web also. A few years ago a postgraduate student at my then University was doing a research paper and found some very distressing images of women from her area on the website of the National Library of Australia. I organised a meeting in Canberra and was happy with the outcome. Margy Burn from NLA had organised a meeting with her relevant staff to hear of the concerns of the student and myself and to take some formal action. The images were taken down and hopefully some valuable lessons learnt from this. The testimony of many of us has highlighted the importance of developing an approach to archival work that incorporates a direct responsibility to people, community and society as well. In my view there is still some way to go yet. Improvements can still be made for Indigenous peoples such as making archives, libraries and other places more welcoming and accommodating. Inclusive images on billboards, welcome signs in Indigenous languages and flying Indigenous flags for starters could go a long way to inviting our mob inside the building for instance. Police stations and jails do it. Sadly these are repositories of our people at an alarming rate so why can’t repositories of our records do the same? Proper content on websites and travelling exhibitions where community can add their stories and artefacts are important. Community engagement is also a useful strategy in developing relationships with each other. This isn’t rocket science either. Invite the Elders in for a cuppa and have an ongoing relationship with them and the community, have stalls during NAIDOC Week, have displays during National Reconciliation Week and other significant events, converse with your local community. Loris was a whiz at this too; and she had to be, as a member of the Aboriginal community, which always expects so much of us. 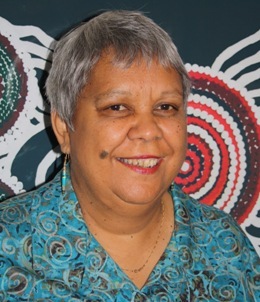 We saw her every year at Musgrave Park during NAIDOC celebrations and at other events working enthusiastically and tirelessly to get the word out about Reclaiming Identity, Place and Story. She was so loved and respected by all of us Black and White. Loris’ favourite colour was lavender and all its shades. I was given the honour of speaking for Loris’ family at her funeral seven years ago next week. Like then and now I can hear her whisper and feel that warm pat on the back of reassurance and approval accompanied by that beautiful quiet and dignified smile.